Fantastic property with spectacular views of the ocean. We're definitely coming back. Perfect location and view. Limited interaction with team after booking which meant all went smoothly. Customer service in booking and availability should any issues arise are excellent. 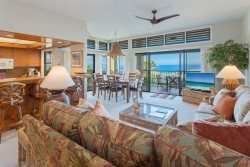 Kapalua Ridge unit 2915 is an great villa with wonderful views. This was by far the best stocked unit for the kitchen, linens and beach equipment. Very clean and well maintained. Walking distance to the beaches. We have stayed in many units and this is one of my favorites. Our experience dealing with Ridge Realty was wonderful. They were responsive and professional and helpful in every way. We had no issues. Things went smoothly. Information on unit was clear & precise. Liked that there was phone # for emergencies, though we never needed to call. Unit was clean. Everything went without a hitch. Loved that at check out, we didn't need to strip the beds etc....like some VRBO places. The Ridge Villas are well maintained. Great location, reasonably priced. The unit was exactly like the photos. The view from lanai was amazing! Loved that there were beach chairs to use. Plus plenty of towels for bath & beach. Unit was clean. AC unit worked well. Great location. Shuttle service for the area was very convenient. I have been renting from you for years, but not for a period in the most recent years. We found it just as before, excellent and will be back. Top notch experience every time. Excellent stay every year! Heaven on earth! Very good value in an upscale resort. It was great - easy, responsive, plain and simple. it was amazing! Great views, relaxing, close enough to beaches and dining but quiet enough to relax when we wanted to. Nice location, clean, good and prompt service/follow up. A great experience when working with the staff about our stay. Answers to our questions were answered in a timely manner. We enjoyed the property. We will definitely rent from you again when we get back to Maui! This property was just like the pictures when looking on-line. It was very clean and well stocked with the necessities needed. This property has beautiful view of the ocean. Locked our keys in the Villa and some one was there in minutes to let us in. We are so thankful for the extra assistance, support, and genuine care provided by Terry Craven. She was always prompt and friendly. Unfortunately, it became necessary for my wife and I to end our stay early due to a family medical emergency. Terry made a difficult situation much easier for us to deal with. We look forward to making a new reservation in the future. We have had the pleasure of staying in unit 1124 two times and will definitively reserve it again. The spacious condo is beautifully decorated, has a spectacular view, with all the amenities needed to make a wonderful vacation. We only had one communication with the staff, and she was very friendly and helpful. The Ridge Villas was such an amazing place to spend our vacation! So well kept and quiet....it was truly relaxing! We were so surprised when we arrived at our unit 411. The view from the living room and bedroom was breathtaking, and we literally spent all our time on the patio just enjoying the view! We were told the unit had been newly remodeled, and we were very impressed by how well it was done....from the granite counters, granite showers and sunken tub, to the beautiful wood cabinets, tile flooring and decor. The layout of the unit gives privacy to the living area from the bedroom. We found the unit very comfortable and would love to return! We made an excellent choice by choosing Ridge Realty LLC as our host and we got an excellent service as was expected. Mahalo!